While considered a boutique hotel, there’s nothing small about The Landmark Mandarin Oriental. With only 113 rooms, the hotel has some of the largest hotel rooms in Hong Kong. Meanwhile, a big name in the interior design industry, Adam Tihany designed The Landmark Mandarin Oriental’s lobby and restaurants. And Michelin starred Amber restaurant is a big deal as it’s one of the World’s 50 Best Restaurants occupying the seventh floor of the hotel. Located in southern Hong Kong on Hong Kong Island, The Landmark Mandarin Oriental is right where the action is- specifically in the business district of Hong Kong called Central. The hotel is actually located in a shopping center which is home to many big name luxury brands called The Landmark. 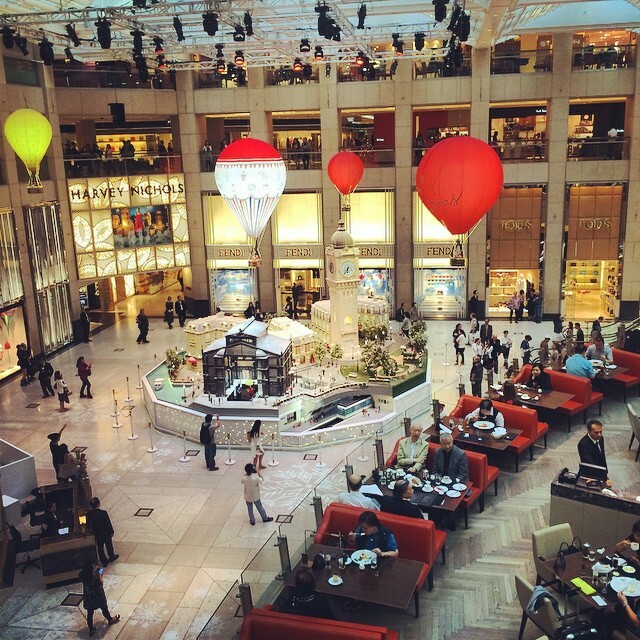 Not only are there plenty of opportunities to shop, but there’s a cafe called Cafe Landmark overlooking the first floor- perfect for people watching. There’s also a Laduree, the Parisian bakery known for its macarons and colorful boxes. And of course The Landmark is home to The Landmark Mandarin Oriental which houses one of the World’s 50 Best Restaurants, Amber by Richard Ekkebus. Outside of the floor to ceiling windows is just a regular busy street with pedestrians and cars. 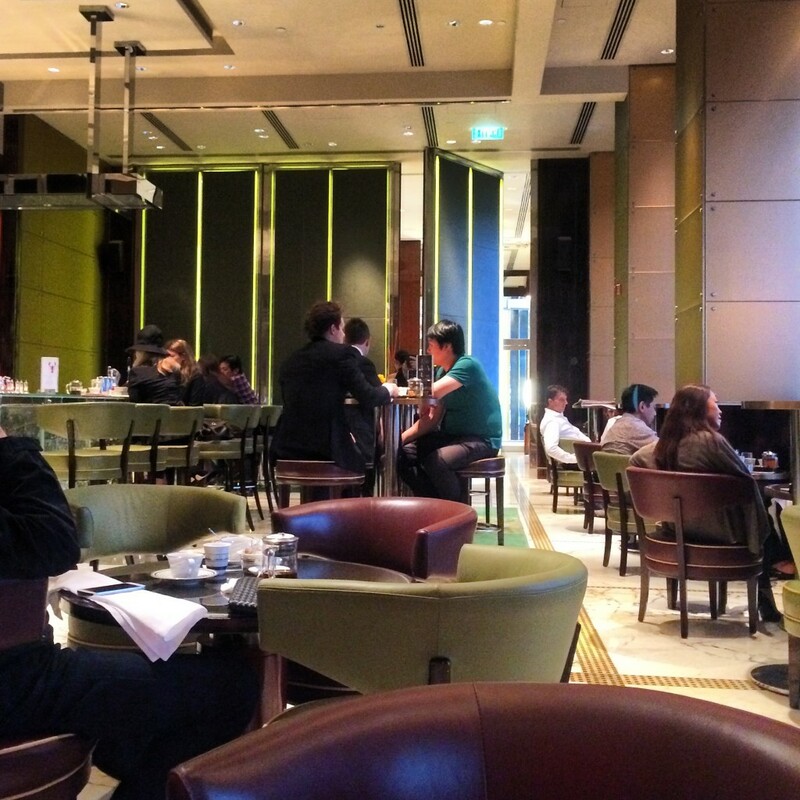 But who needs to look outside of MO Bar (where afternoon tea is served) when it was designed by Adam Tihany, the award winning interior designer? 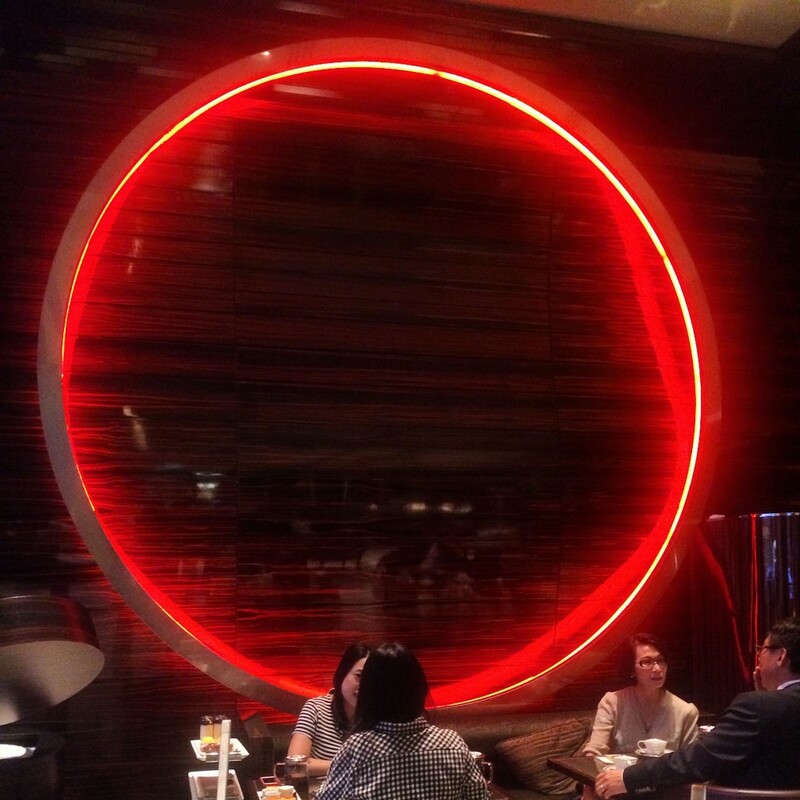 With earthy colors all around, a lighted bright red circle all the way inside the bar demands attention. It’s “a Chinese symbol for shared experience”. MO Bar is a lounge by morning (and afternoon) and a bar by night located immediately to the left of entering through the hotel’s doors. 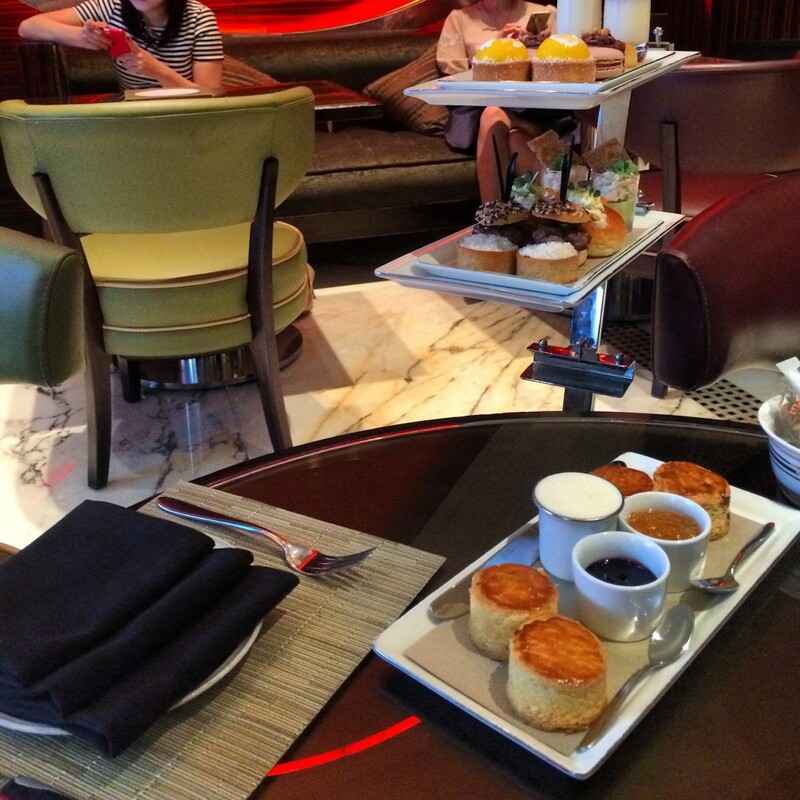 Hip, cool and untraditional are some words to describe having afternoon tea at MO Bar, which consists of two floors. 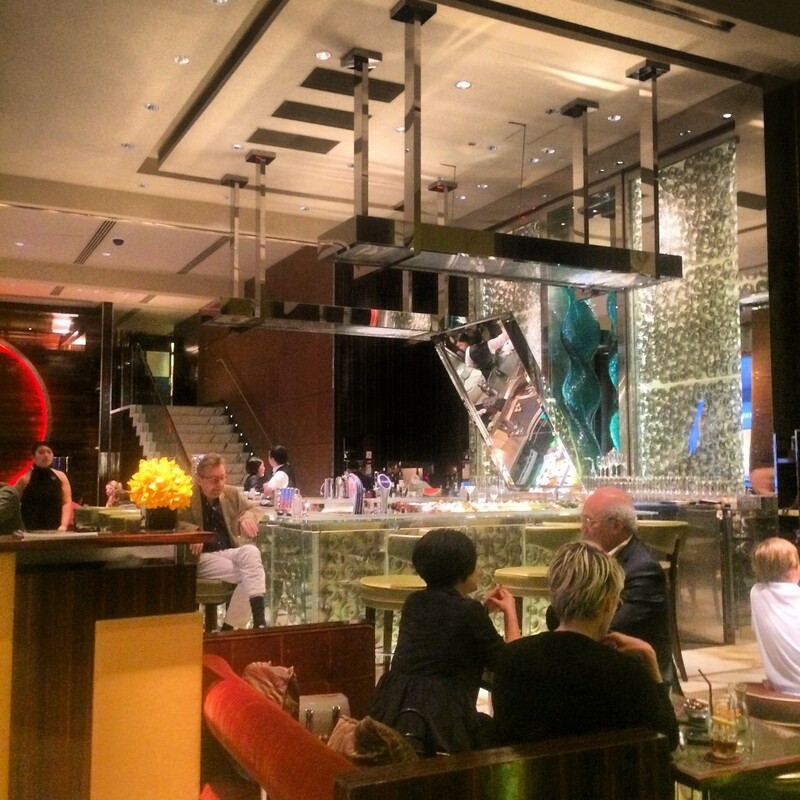 And just like the hotel itself, the MO Bar also has a small, intimate and contemporary feel. The Landmark Mandarin Oriental serves teas from JING Tea, a brand you can find in luxury hotels and Michelin starred restaurants. There are only a few types of teas on the menu- jasmine, English breakfast, earl grey, peppermint, verbena or lemongrass ginger but for an extra supplement per person, you can also get oolong, green or white tea. 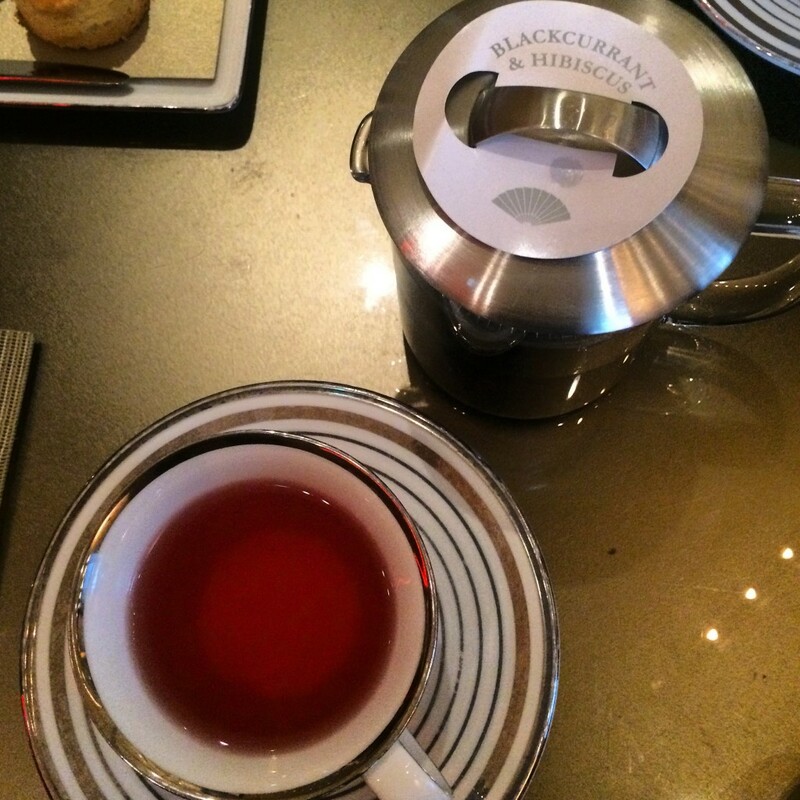 Or you can ask around and like me, get JING Tea’s Blackcurrant and Hibiscus, a fruity and sweet tea. 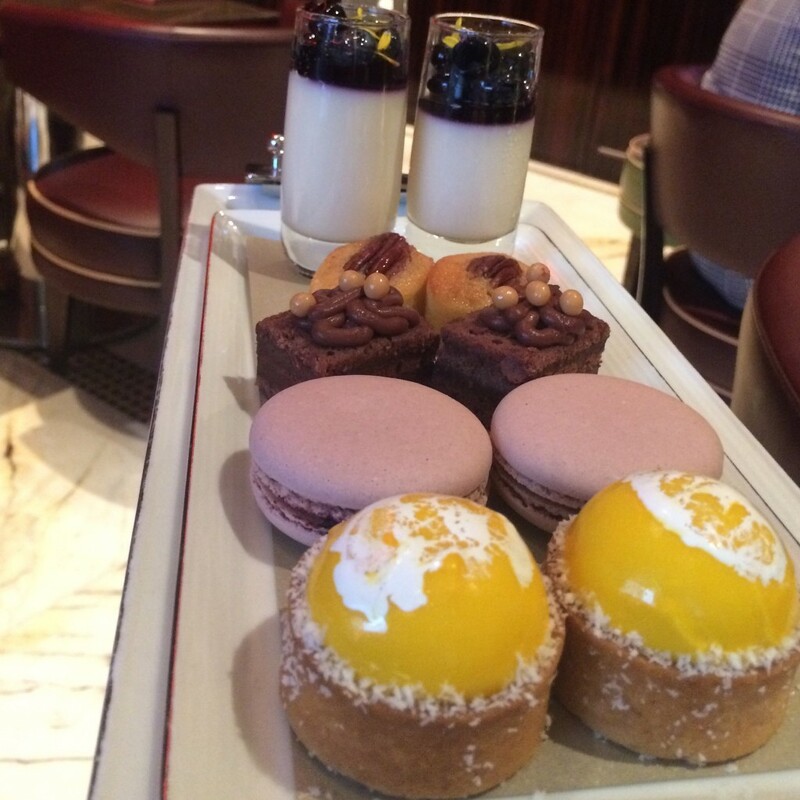 There’s one afternoon tea set offered at The Landmark Mandarin Oriental. But regulars need not worry as the menu changes monthly. First up are the savories – artichoke quiche with hazelnut & grated parmesan; smoked salmon roll with winter vegetables & salmon eggs; mini teriyaki beef burger; wild prawns in marie rose sauce; chicken milk bun with egg mimosa. 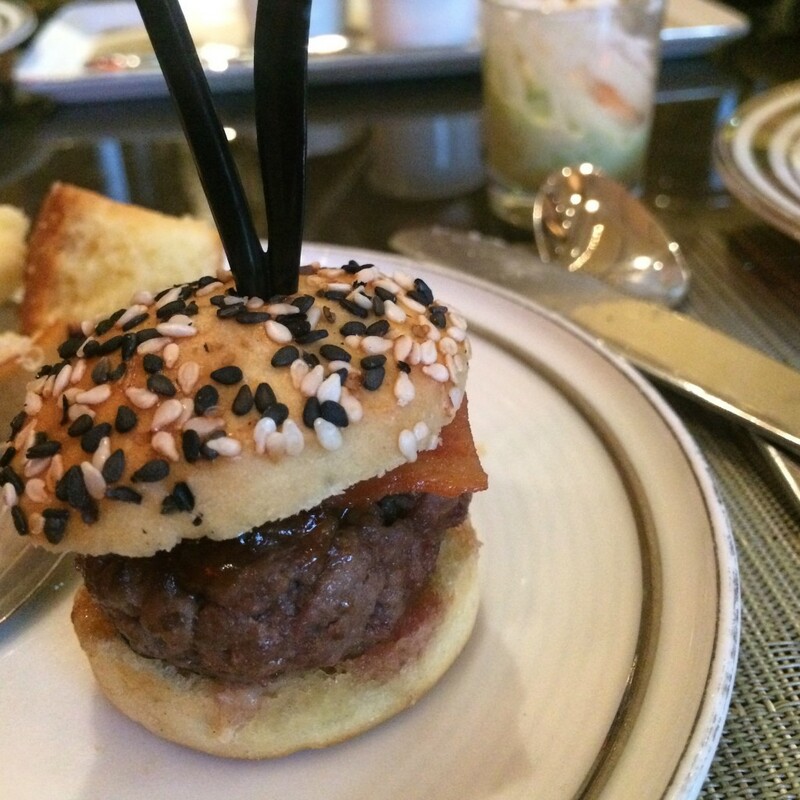 The highlight… the mini burger! Overall, great quality food served warm and just like the ambience, there are contemporary touches. You won’t find the traditional English afternoon tea smoked salmon tea sandwich, instead it’s rolled! Also, the blueberry jam is a must try as it’s unique and you can only have it at the hotel. The presentation is just like the food and ambience combined- unique and untraditional. Two plates with the savories and sweets are put on a stand a few inches away from the table. 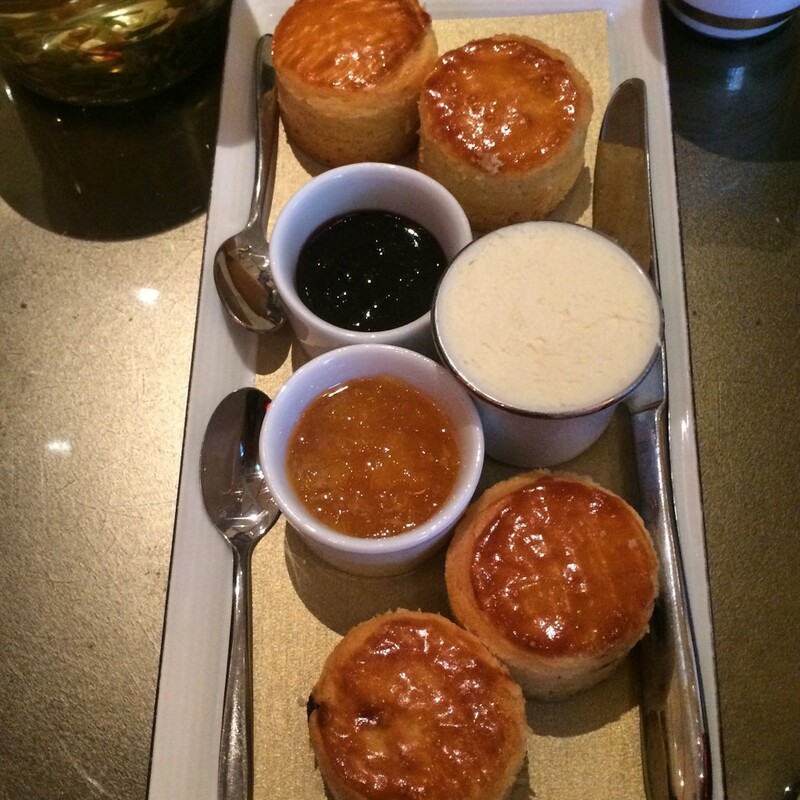 Meanwhile the scones were served on a separate plate and put on the table. With clean cut white plates and tall, glass tea pots, the whole presentation is modern, adding to the ambience of MO Bar. 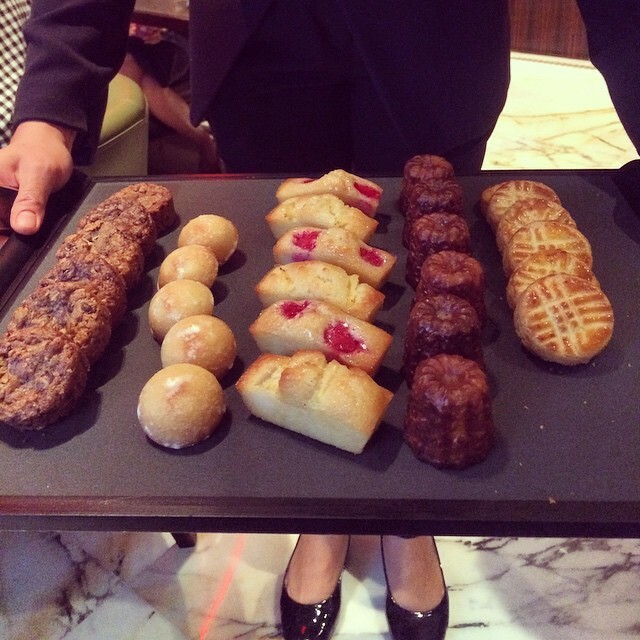 I’m very impressed with The Landmark Mandarin Oriental’s service. You can tell that they really take service seriously as there are over 300 staff in this boutique hotel of only 113 rooms. When I asked a question at the reception desk, asking for a WiFi password and even asking about the type of tea, staff were friendly, helpful and provided answers and solutions right away. Yes. A code is needed to access the super fast WiFi. You can ask a server to get you a code. The Landmark Mandarin Oriental regularly posts new content and uses its social media platforms – Twitter, Facebook and Instagram to provide followers and fans with updates and new happenings with the hotel. Follow them on Twitter. 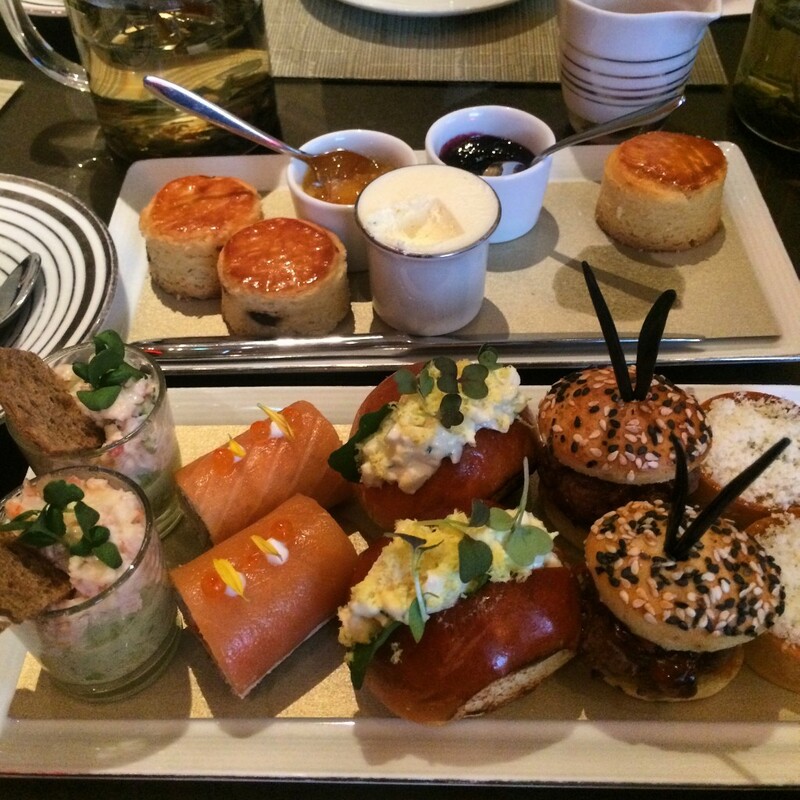 For a cool twist to traditional afternoon tea in the middle of a bustling Hong Kong, afternoon tea at The Landmark Mandarin Oriental is not to be missed. 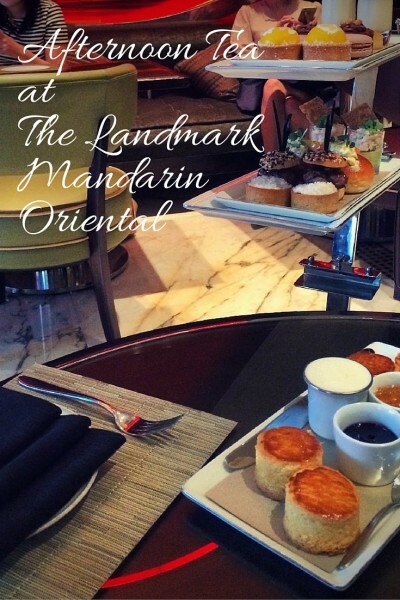 Note: I was a guest of The Landmark Mandarin Oriental for afternoon tea. All views are my own.